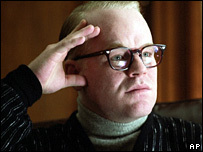 Capote, a biopic about US writer Truman Capote, has been voted the best picture of 2005 by a group of leading US film critics. Philip Seymour Hoffman, who plays the lead role, was also named best actor by the National Society of Film Critics. Capote focuses on the years the author spent researching and writing In Cold Blood, which was inspired by the 1959 murder of a farming family in Kansas. Meanwhile, Reese Witherspoon won best actress for her role in Walk The Line. Witherspoon plays the wife of country star Johnny Cash in the movie, which tells the story of the famous singer's life. Last month both Hoffman and Witherspoon were nominated for Golden Globe awards for their roles in the two films. And both films were shortlisted for awards by The Producers Guild of America (PGA), while Capote was also shortlisted by the Writers Guild of America (WGA). In other categories voted for by the critics, David Cronenberg was named best director for the crime drama A History of Violence and Ed Harris won best supporting actor for his role in Cronenberg's film. Amy Adams - who won a special jury prize at the 2005 Sundance Film Festival - was named best supporting actress for Junebug, a comedy drama looking at family dynamics. And the best foreign language film honours went to Fatih Akin's Head-On (Gegen die Wand), which explores the relationship between two German Turks who enter into a marriage of convenience. However, cowboy romance Brokeback Mountain - which dominated the Golden Globe shortlist with seven nominations and is strongly tipped for Oscar success in March - did not pick up any prizes, despite a string of nods from the New York, Los Angeles and Boston Critics' Circles. The panel of critics who vote for the annual National Society of Film Critics awards, now in their 40th year, all work for major US papers and magazines.